Der Togo, in Westafrika eingerahmt von Ghana, Burkina Faso und Benin, ist eines der ärmsten Länder der Welt (Platz 162 von 187 im HDI). Der Name „Togo“ leitet sich aus der Sprache der Eingeborenen, den Ewe, ab, und bedeutet so viel wie „Haus des Meeres“. Von 1884 bis 1916 war der Togo deutsche Kolonie. Im Togo kann man das stärkste Tier der Welt antreffen, den Rhinozeros-Käfer, der das 850-fache seines Körpergewichts stemmen kann. Außerdem sehenswert: der riesige Vodoo Market in der togolesischen Hauptstadt Lomé. Sieht man von der überraschenden WM-Teilnahme 2006 ab, konnte die togolesische Fußballnationalmannschaft international noch nie für Furore sorgen und kam auch beim Afrika-Cup noch nie über ein Viertelfinale hinaus. 2006 sorgte der Togo für Negativschlagzeilen, als man sich während der laufenden WM-Endrunde aufgrund eines Prämienstreits vom deutschen Trainer Otto Pfister trennte. Der berühmteste Kicker der „Eperiers“ (Sperber) ist zweifelsohne Stürmer Emmanuel Adebayor von Tottenham Hotspur, der seit eines Anschlags auf den Mannschaftsbus der Togolesen während des Afrika-Cups 2010 nicht mehr für sein Land aufgelaufen ist. Zudem ist der Togolese Souleymane Mamam der jüngste Spieler der Welt, der jemals in einem WM-Qualifikationsspiel zum Einsatz kam. Mein Togo-Trikot bekam ich abermals von Christian „Trikot“ Meyer – vielen Dank dafür. 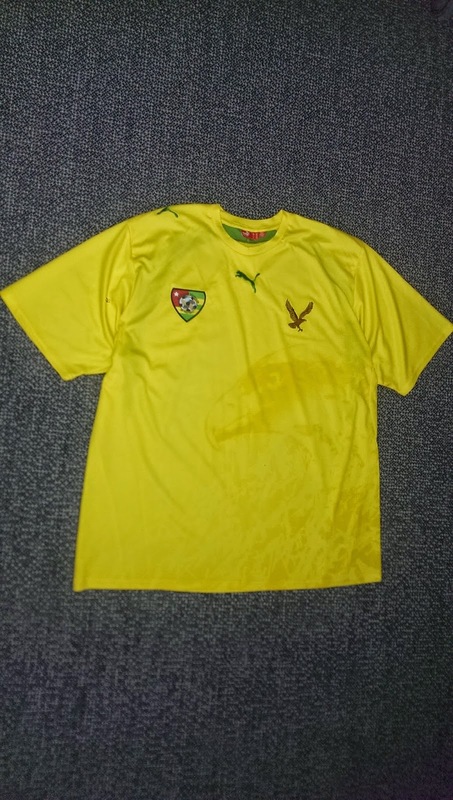 Es handelt sich um das gelb-grüne Puma-Trikot, mit dem der Togo bei seiner historischen WM-Teilnahme 2006 an den Start ging. Besonderer Blickfang ist natürlich wie bei vielen afrikanischen Trikots ein abgebildetes Tier, in dem Fall ein Sperber, der sich unauffällig auf der Vorderseite abzeichnet. 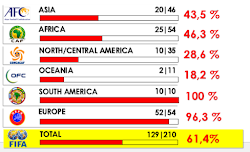 West African Togo, which is framed by Ghana, Burkina Faso and Benin, is one of the poorest countries on earth (place 162 of 187 in the HDI). The name “Togo” comes from the native language of the Ewe tribe and means something like “house of the sea”. 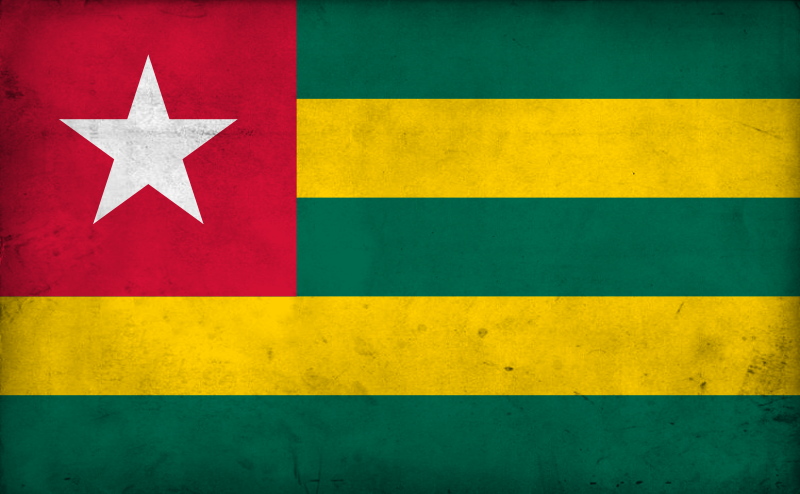 Togo was a German colony between 1884 and 1916. In Togo, you might meet the world’s most powerful animal, the rhinoceros beetle, who is able to lift 850 times its own weight. Also worth seeing: the huge Vodoo Market in the Togolese capital Lomé. 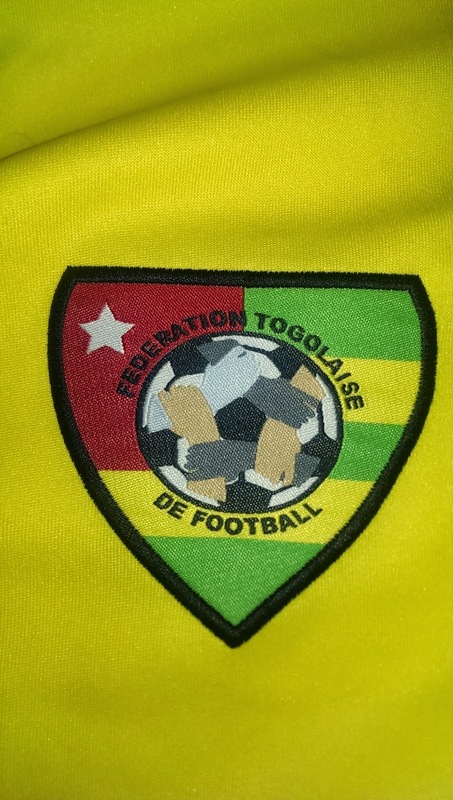 Aside from their surprising participation in WC 2006, the Togolese football team never caused any furors in international football and did not even go further than a quarter final in the African Cup of Nations. In 2006, Togo caused some negative headlines as they dismissed their German coach Otto Pfister within the running World Cup as a result of a dispute about bonus payments. The most famous footballer of the “Eperiers” (sparrowhawks) is definitely Emmanuel Adebayor from Tottenham Hotspur who doesn’t play for his nation anymore after a hi-jacking of the Togolese team bus during the African Cup of Nations in 2010. 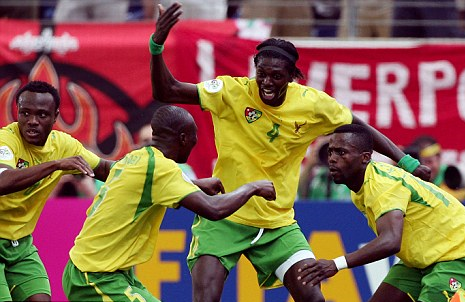 By the way, Togolese Souleymane Maman is the youngest player ever to be initiated in a WC qualifier match. Again, I got my Togo shirt from Christian “Trikot” Meyer – thank you a lot! 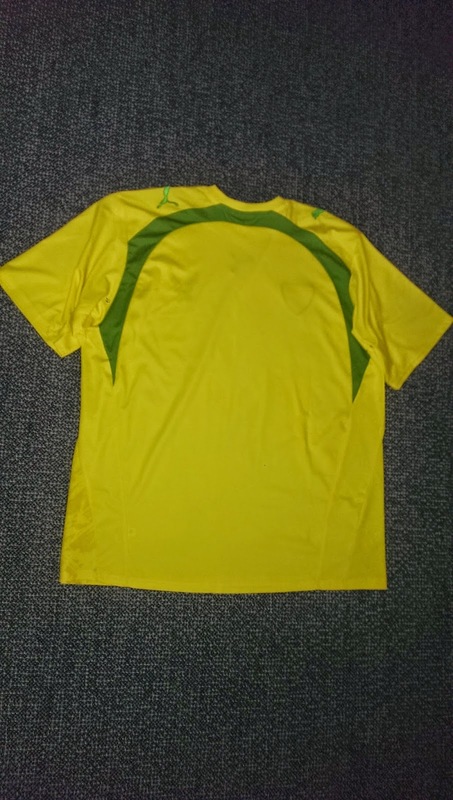 It’s the yellow-green one they used for their historic WC participation in 2006. 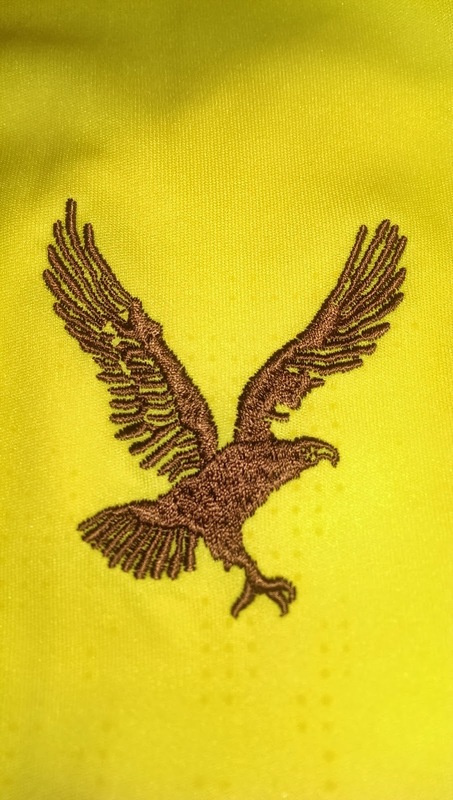 As many of the African Puma shirts, its highlight is an animal in the pattern, in this case a big but inconspicuous sparrowhawk right on the front.